Myxozoans are microscopic metazoan endoparasites that most commonly parasitize invertebrates, typically oligochaetes, polychaetes, bryozoans and poikilotherms, primarily fishes but also reptiles and amphibians (Kent et al., 2001; Canning and Okamura, 2004; Lom and Dykova, 2006). They have also been found in homeotherms including birds, moles and humans (Boreham et al., 1998; Friedrich et al., 2000; Moncade et al., 2001; Lowenstine et al., 2002; Dykova et al., 2007). A large variety of fishes in aquaculture ponds are vulnerable to various parasitic infections, out of which Myxozoa is emerging as a major group. Myxozoans are one of the economically important group of microscopic metazoan parasites as they infect fish harvested for food. New myxosporean pathogens are continually emerging and threatening the development of pisciculture all over the world. Myxozoan parasites are widely dispersed in native and pondreared fish populations. Most infections in fish create minimal problems, but heavy infestations can become serious, especially in fingerlings. Nursery ponds for rearing fry and fingerlings are enough in Punjab. Management practices in the available nursery ponds of both the government and private sectors are at a standard level. But fish farmers often raise questions about the quality of fry obtained from nursery ponds, where they have observed reduced growth performance. The poor growth of fingerlings depends on many factors. Myxozoan parasites are common in juvenile carp in nursery ponds. High mortality rates caused by myxosporidians infection in the gills have raised serious concern among fish farmers. However, histopathology has been successfully used to diagnose the pathogenecity of carps throughout the world. Davis (1923) studied the development and sporulation of cysts of myxosporidian species. There are alarming economic losses due to Myxobolus spp. infestation of the major carp in the nursery ponds as reported by Sanaullah and Ahmed (1980). The present work was therefore undertaken to investigate the pathogenecity of the gills of fingerlings to clarify the prevalence rate and nature of damage caused by myxosporidian parasites. During the survey, live fingerlings of two species were collected from nursery ponds located in the village Fagan Majra, District Fatehgarh Sahib, Punjab, India. The fish species examined included native carps Labeo rohita Hamilton vern. rohu and Cirrhinus mrigala Hamilton vern. mrigal. The live specimens were collected and brought to the laboratory in oxygenated bags for further investigation. A total of 70 fish specimens belonging to two genera were examined for the presence of myxozoan infections. Out of which, 44 fishes were found to be infected with myxozoan parasites in the form of plasmodia. Prevalence of infection was recorded to be 62.85%. Various organs such as skin, gills, heart, fins, scales, stomach, intestine and kidney were examined under stereozoom binocular microscope for the presence of plasmodia. The infection was recorded in the gills only in the form of minute to large-sized plasmodia. The infected gills containing plasmodia were fixed in Bouin’s fixative and preserved in 10% formalin for further study. For fresh myxospores, each plasmodium was ruptured in normal saline (0.85%) with the help of a fine needle on a clean slide and examined under light microscope for the presence of myxospores. The fresh myxospores were photographed under phase contrast microscope (Image Processing Unit Magnus MLX Model No. 12G961) in the Parasitology Laboratory, Department of Zoology and Environmental Sciences, Punjabi University, Patiala. For dry preparations, thin smear was made on a clean slide, air dried, fixed in methanol. In case of permanent (wet) preparation, smear was fixed in Bouin’s fixative. The stains such as Heidenhain’s Iron haematoxylin and modified Ziehl-Neelsen were used to study the myxospore morphology as per the protocol given by Kaur and Singh (2008). Slides were mounted in DPX. Ziehl-Neelsen stained the myxozoan myxospores bright red in colour and was useful to count the number of coils of polar filament inside the polar capsule. Similarly, Iron-haematoxylin stain proved useful to show the presence or absence of intercapsular process and number of capsulogenic and sporoplasmic nuclei. Myxospores were measured with the help of calibrated ocular micrometer according to the guidelines of Lom and Arthur (1989). Photography of fresh myxospores was done under the phase contrast microscope (Image Processing Unit Magnus MLX Model No. 12G961) in the Parasitology Laboratory, Department of Zoology and Environmental Sciences, Punjabi University, Patiala and of stained myxospores was done under Leica photographic unit at Sophisticated Instrumentation Center, Punjabi University, Patiala. Line drawings were made from stained material with the aid of camera lucida. For calculations of prevalence, the following formulae were applied. The pathogenic effects caused by myxozoan parasites have been studied with the help of histological sections of the infected organs. For light microscopy, infected organs were cut into small pieces and fixed in Bouin’s fixative. For histology, the tissue samples were dehydrated in ascending grades of ethanol, cleared in xylene, embedded in paraffin wax, sectioned at 8-10 μm and stained with Luna’s method (Luna, 1968) and haematoxylin and eosin (H+E). GPI was calculated on the basis of number of plasmodia present per gill (one side) visible under the stereozoom binocular microscope. 0-0 (no infection-0); 1-5 (light infection-1); 5-10 (moderate infection-2); 10-20 (heavy infection-3); 20-50 (severe infection-4). The location of myxosporean plasmodia in various tissues of the gills was determined with the help of histological sections stained with Luna’s method and were categorized into types according to the guidelines of Molnar (2002). Intralamellar-epithelial type (LE-LE1, LE2): Small plasmodia (LE1) and large plasmodium deforming several gill lamellae (LE2). • LV1: Plasmodium located centrally in the gill lamellae. Intrafilamental-vascular type (FV-FV1, FV2): Small round or elongated plasmodia in the afferent artery (FV1) and large plasmodia formed by the fusion of several plasmodia near the end of the gill filament (FV2). Plasmodium located in the gill arch (AC, AV, AE): Plasmodia developing in the cartilaginous structure of the gill arch (AC). In AV plasmodia are developing in the blood vessels of the gill arch and in AE type plasmodia developing in the epithelial or connective tissue elements of the gill arch. Various water parameters were analyzed such as water temperature, pH, conductivity, TDS and dissolved oxygen (DO). All the parameters were recorded on the spot with the help of portable water testing kit. Plasmodia: Large, creamish, elongated in shape, visible with naked eye, 3-10 mm in diameter, attached to the gill filament, histozoic, 15-25 in number per gill, 1500-2000 myxospores present per plasmodium. Highly symptomatic (gills full of abscesses, haemorrhagic) (Figure 1a). 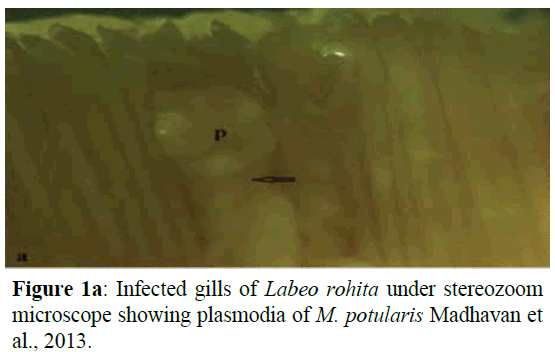 Figure 1a: Infected gills of Labeo rohita under stereozoom microscope showing plasmodia of M. potularis Madhavan et al., 2013. This is clearly mentioned in Table 1 and Figures 1b-3c. Table 1: Measurements (µm) and ratio of M. potularis Madhavan, Bandyopadhyay and Santosh, 2013. 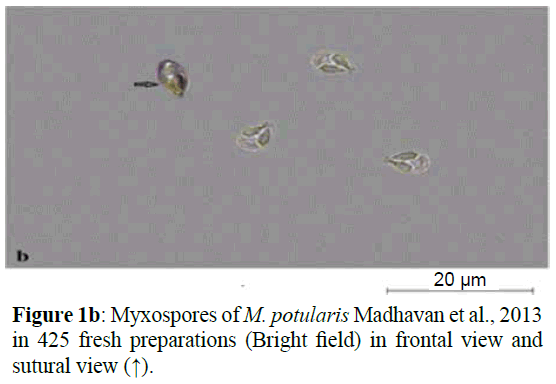 Figure 1b: Myxospores of M. potularis Madhavan et al., 2013 in 425 fresh preparations (Bright field) in frontal view and sutural view (↑). Figure 2: a) Myxospores of M. potularis Madhavan et al., 2013 stained in Ziehl-Neelsen. b) Myxospores of M. potularis Madhavan et al., 2013 stained in Iron haematoxylin with extruded polar filaments. 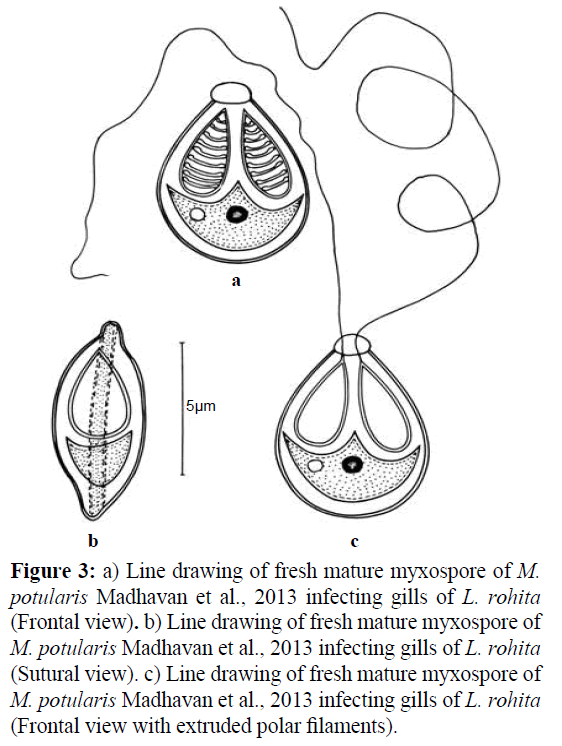 Figure 3: a) Line drawing of fresh mature myxospore of M. potularis Madhavan et al., 2013 infecting gills of L. rohita (Frontal view). b) Line drawing of fresh mature myxospore of M. potularis Madhavan et al., 2013 infecting gills of L. rohita (Sutural view). c) Line drawing of fresh mature myxospore of M. potularis Madhavan et al., 2013 infecting gills of L. rohita (Frontal view with extruded polar filaments). Measurements based on 10-12 myxospores in frontal view: Myxospores measure 7.83×4.79 μm, oval in frontal view bluntly pointed with prominent knob at the anterior end and greatly rounded pot-like posterior end. Shell valves measure 0.30 μm thick. Parietal folds absent. Polar capsules two, equal, pyriform, measure 4.00×1.23 μm sharply pointed at the anterior end and rounded posterior end, occupy three fourth of the myxospore body cavity, placed towards the anterior proximity. Polar filament coils 7-9 in number, arranged perpendicular to the polar capsule axis. Polar filaments thread-like when extruded, measure 25 μm in length. Intercapsular process (ICP) absent. Sporoplasm agranular, homogenous and cup-shaped with two nuclei, 1.50-1.25 μm in diameter and an iodinophilous vacuole present, 0.70 μm in diameter. The observations on the specimens of M. potularis Madhavan et al. (2013) are in conformity with the original description except for some minor variations in the size of the myxospore, polar capsules and number of coils in the polar capsule. Earlier, the parasite was recorded from gill filaments of C. reba, L. calbasu, L. bata and L. gonius in West Bengal (India). A new locality- Nursery Pond, Fagan Majra, District Fatehgarh Sahab, Punjab (India) and a new host- Labeo rohita are recorded for this parasite in the present study (Table 2). In addition, gill plasmodial index (GPI) and histopathogenesis are provided in the present study. Table 2: Comparison of M. potularis Madhavan, Bandyopadhayay and Santosh, 2013 with the original descriptions (measurements in micrometer). Plasmodia: Small, microscopic, round to oval, white, 0.5- 1.2 mm in diameter, attached to the gill lamellae, histozoic, 1-5 in number per plasmodium. Mucous laden gills and pale haemorrhagic (Figure 4a). Figure 4a: Gills of Cirrhinus mrigala under stereozoom microscope showing plasmodia of M. rocatlae Basu and Haldar, 2002. This is clearly mentioned in Table 3 and Figures 4b-6c. Table 3: Measurements (µm) and ratio of M. rocatlae Basu and Haldar, 2002. 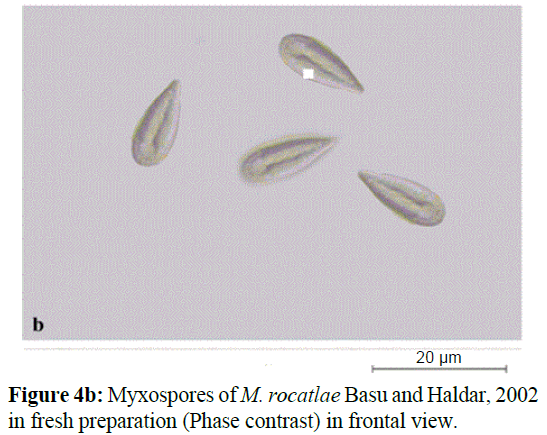 Figure 4b: Myxospores of M. rocatlae Basu and Haldar, 2002 in fresh preparation (Phase contrast) in frontal view. 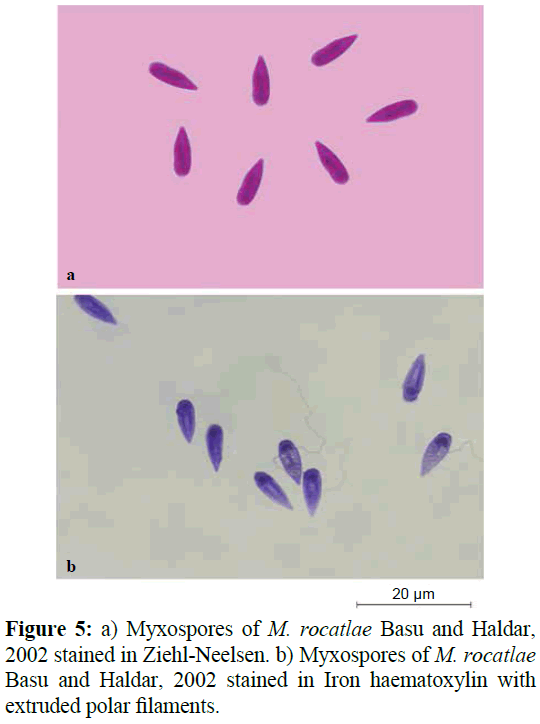 Figure 5: a) Myxospores of M. rocatlae Basu and Haldar, 2002 stained in Ziehl-Neelsen. b) Myxospores of M. rocatlae Basu and Haldar, 2002 stained in Iron haematoxylin with extruded polar filaments. Figure 6: a) Line drawing of fresh mature myxospore of M. rocatlae Basu and Haldar, 2002 stained in Ziehl-Neelsen (Frontal view). b) Line drawing of fresh mature myxospore of M. rocatlae Basu and Haldar, 2002 (Sutural view). c) Line drawing of fresh mature myxospore of M. rocatlae Basu and Haldar, 2002 stained in Ironhaematoxylin (Frontal view). Measurements based on 10-12 myxospores in frontal view: Myxospores measure 15.62×5.1 μm, elongately pyriform in frontal view having anterior end sharply pointed and slightly broad posterior end. Sutural line straight. Both shell valves uniformly thick, smooth, symmetrical, 0.9 μm thickness. Parietal folds absent. Polar capsules rarely two, equal, sometimes unequal, elongately pyriform, running parallel to each other, measure 10.0×1.3 μm (larger polar capsules) and 7.0×1.30 μm (smaller polar capsules), having blunt anterior and rounded posterior end, occupying three fourth of the myxospore body cavity. Polar filament coils arranged perpendicular to the polar capsule axis, 9-10 in larger and 6-7 in smaller polar capsule. Intercapsular process (ICP) absent. Sporoplasm agranular and homogenous, occupy rest of the myxospore body cavity. Sporoplasmic nuclei two, 0.2-0.2 μm in diameter. Iodinophilous vacuole absent. Type specimen: Paratypes are myxospores stained in Ziehl- Neelsen and Iron-haemotoxylin, deposited in the Parasitology, Laboratory, Department of Zoology and Environmental Sciences, Punjabi University, Patiala, India. Slide no. CM/ZN/10.07.2015 and CM/IH/10.07.2015. 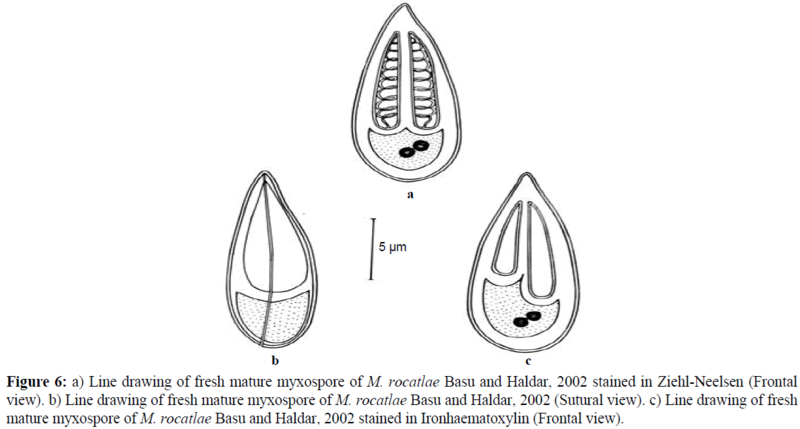 The observations on the specimens of M. rocatlae Basu and Haldar (2002) are in conformity with the original description except for some minor variations in the size of the myxospore and polar capsules. In the present study, myxopores with equal polar capsules are recorded. Earlier, the parasite was recorded from gills and gut of Catla-Rohu hybrid in West Bengal (India). In the present study, a new locality- Nursery Pond, Fagan Majra, District Fatehgarh Sahib, Punjab (India) and new host- Cirrhinus mrigala are recorded for this parasite (Table 4). In addition, gill plasmodial index (GPI), tissue location and histopathogenesis are provided in the present study. Table 4: Comparison of M. rocatlae Basu and Haldar, 2002 with the original description (measurements in micrometer). The plasmodia of M. potularis are located in the afferent artery of the gill filament of L. rohita. The large-sized abscesses on the gills of L. rohita are formed by the fusion of several plasmodia and are typed as intrafilamental vascular type of plasmodium FV2. The plasmodium is located inside the gill filament, elongated in shape and size ranging from 3-10 mm in diameter. Kaur et al. (2014) also reported that large-sized plasmodia damaged more than 50% of the gills causing respiratory distress and suffocation. Similar studies have been made by Schulman (1957), Current and Janovy (1978), Dykova and Lom (1978), Shariff (1982), Bowser and Conroy (1985), Rukayani (1990), Martins et al. (1997), Adriano et al. (2009), Chavda et al. (2010), de Campos et al. (2011) and Kaur and Katoch (2014). The histological section show severe infection damaging almost 95% of the gill filament and also overlying gill lamellae due to the hypertrophy, hyperplasia, vacuolization of the stratified epithelium and vascular endothelium of the filament. Necrosis of cellular elements of gill lamellae has been recorded due to severe infection. The observations clearly indicated that the destruction of respiratory surface and interruption of the vascular supply which may result in the suffocation of the fish due to lack of oxygen and can ultimately lead to the death of the fish (Figures 7a-7c). According to Lebelo et al. (2001) structural damage and surface inflammation of gills leading to difficulties in osmoregulation and respiration causing decrease in oxygen uptake that causes hypoxia. Eissa (2002) and Sabri et al. (2010) described that such damages make gills and accessory respiratory organs less functional by reducing the respiratory surfaces. Histopathological changes derived from Myxobolus spp. infection in the gills of Labeo rohita and Cirrhinus mrigala are in accordance with the findings of Dey et al. (1988), Sanaullah and Ahmed (1980), and Dykova and Lom (1978). Kalavati and Narasimahamurti, (1985) and Kaur and Katoch (2014) observed that rupturing of cysts can also lead to hemorrhages, and may result in considerable loss of respiratory surface. 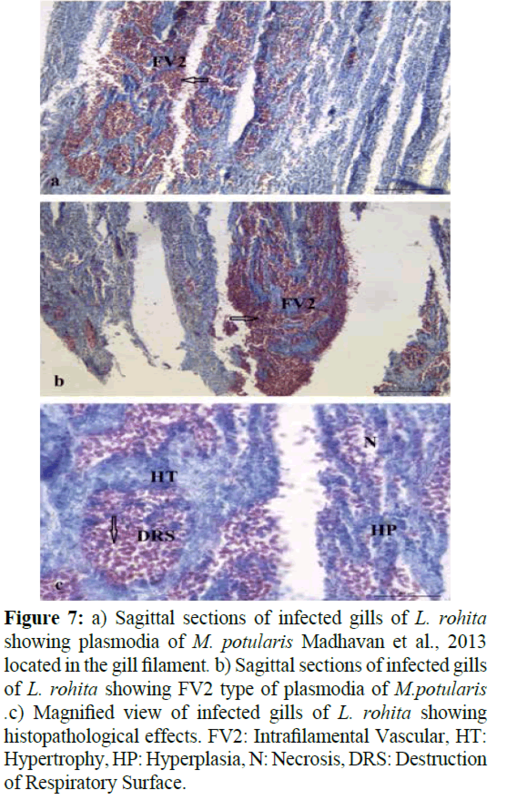 Figure 7: a) Sagittal sections of infected gills of L. rohita showing plasmodia of M. potularis Madhavan et al., 2013 located in the gill filament. b) Sagittal sections of infected gills of L. rohita showing FV2 type of plasmodia of M. potularis. c) Magnified view of infected gills of L. rohita showing histopathological effects. FV2: Intrafilamental Vascular, HT: Hypertrophy, HP: Hyperplasia, N: Necrosis, DRS: Destruction of Respiratory Surface. The plasmodium of M. rocatlae is located in the fine blood capillaries at the tip of the gill lamella of C. mrigala and is typed as intralamellar vascular type of plasmodium LV1 (Figures 8a and 8b). The plasmodia are round to oval and size ranging from 0.5-1.2 mm in diameter. The plasmodium occupies only single gill lamella at its tip and displaying the adjacent gill lamellae. Histological sections also reveal hypertrophy, lifting and hyperplasia of epithelial cells, goblet cells and pillar cells within the gill lamellae thereby damaging and reducing the respiratory surface leading to stress conditions due to the lack of oxygen supply (Figure 8c). Similar observations were made by (Adriano et al., 2009) that the presence of plasmodia affect the gill functions and drastically reduces the respiratory surface. The location of plasmodia in the intralamellar site was recorded to be associated with hypertrophy and inflammation. (Kaur et al., 2013; Kaur and Katoch, 2014) reported cellular changes leads to the fusion of adjoining secondary lamellae. The presence of plasmodia exerted pressure on adjacent gill tissue and reduced the respiratory surface, particularly in cases of heavy infection with macroscopic cysts, or those with microscopic plasmodia in the lamellae. According to Longshaw et al., (2005) some species can affect growth, reproduction and cause death of the host and economic losses caused by these parasites in aquaculture have been well documented by Lom and Dykova (2006). In the present study, small cysts were observed in the gill lamellae infecting with M. rocatlae. Similarly, Szekely et al. (2015) reported the development of small cysts in the gill lamellae formed by M. kalavatiae, M. meerutensis, M. bhadrensis and M. catlae. The size of plasmodia varied with the species of the myxozoan parasite. Figure 8: a) Sagittal sections of infected gills of C. mrigala showing plasmodia of M. rocatlae Basu and Haldar, 2002 located in the gill lamellae. b) Sagittal sections of infected gills of C. mrigala showing LV1 type of plasmodia of M. rocatlae. c) Magnified view of infected gills of C. mrigala showing histopathological effects. LV1 Intralamellar vascular, HT: Hypertrophy, HP: Hyperplasia, LEC: Lifting of Epithelial Cells. At the time of collection period, various parameters were also recorded. The mean value of Temperature, pH, Dissolved oxygen, Conductivity and TDS were 21.4, 8.21, 9.14, 1.33 and 891 respectively. All the parameters were recorded with the help of portable water testing kit. Nearly all the parameters measured were within the range of optimal values for carp production (Albaster and Lloyd, 1982; Boyd, 1982; Piper et al., 1982 and Svobodova et al., 1993). Awal et al. (2001) and Saha et al. (2012) affirm the role of water temperature and dissolved oxygen in inducing myxozoan infection in carps. Also Banergee and Bandyopadhyay (2010) observed water temperature, pH, and DO an important water parameters that are related to disease infestation as they fluctuate more rapidly. During the entire sampling period, age and length of the fingerlings was recorded. The age of the fingerlings was recorded as 1-3 months and length ranged from 4-4.4 cm. The study clearly indicated light to severe infection in fingerlings as indicated by the gill plasmodial index (GPI). Gill plasmodial index (GPI) was recorded for both of Myxobolus species and ranged from 1-4 as calculated on the basis of number of plasmodia present per gill (one side) visible under the stereozoom binocular microscope and with naked eye (Kaur and Attri, 2015). Maximum number of plasmodia was recorded in Labeo rohita with M. potularis with GPI of 4 indicating severe infection followed by M. rocatlae in Cirrhinus mrigala with GPI of 1 indicating light infection. Fish fingerlings become more susceptible to myxozoan infection because of their immature immune system as discussed by Anderson (1974). The present study represents the first time data of myxozoan parasites infecting fingerlings in nursery ponds in Punjab, India. During the study, two already known species M. potularis Madhavan et al. (2013) and M. rocatlae Basu and Haldar (2002) were redescribed morphologically. In addition to this histopathogenesis have been also described. Plasmodia of M. potularis are located in the afferent artery of the gill filament by the fusion of several plasmodia and are typed as Intrafilamental vascular type (FV2) resulting necrosis, hypertrophy and hyperplasia of cellular elements of the gill lamellae. In M. rocatle, Plasmodia is of LV1 type showed hypertrophy, lifting and hyperplasia of epithelial cells, goblet cells and pillar cells within the gill lamellae. GPI was calculated as per Kaur and Attri (2015). M. potularis showed much more intensity of infection than M. rocatlae. Also some parameters like temperature, pH, DO and conductivity were recorded at the sampling time. The authors acknowledge the facilities provided by Instrumentation lab Punjabi University, Patiala. Financial support for this study was provided by UGC-CAS grant Panjab University, Chandigarh. Adriano, E.A., Arana, S., Alves, A.L., Silva, M.R., Ceccarelli, P.S. (2009) Myxoboluscordeiroi sp., a parasite of Zungarojahu (Siluriformes: Pimelodiade) from Brazilian Pantanal: morphology, phylogeny and histopathology. Vet Parasitol, 162, 221-229. Alabaster, J. S., Loyod, R. (1982) Water quality criteria for fresh water fish: Butterworths, London p: 315. Anderson, D.P. (1974) Fish immunology In: Diseases ofFishes. (eds. S.F. Sneiszko; H.R. Axelrod) F.H. Publication Inc., New Jersey. Awal, M.A., Begum, A.A., Chandra, K.J., Ahmed, G.U., Kurohmaru, M. (2001) Myxosporidian infection of gills and skin among carp from nursery ponds in Bangladesh: histopathology.Vet Archiv71, 265-276. Banerjee, S., Bandopadhyay, P.K. (2010) Observation on prevalence of ectoparasites in carp fingerlings in two districts of West Bengal.J Parasit Dis34, 44-47. Basu, S., Haldar, D.P. (2002) Observations on three new species of MyxobolusButschli, 1882 from hybrid carps of West Bengal, India. Indian J Environ Ecoplan6, 629-640. Boreham, R.E., Hendrick, S., O'Donoghue, P.J., Stenzel, D.J. (1998) Incidental finding of Myxobolusspores (Protozoa: Myxozoa) in stool samples from patients with gastrointestinal symptoms. J ClinMicrobiol36, 3728-3730. Bowser, P.R., Conroy, J.D. (1985) Histopathology of gill lesions in channel catfish associated with Henneguya. J Wildl Dis 21, 177-179. Boyd, C.E. (1982) Water Quality Management of Pond Fish Culture. DevAquacult Fish Sci 9, Elsevier, Amsterdam p: 318. Canning, E.U., Okamura, B. (2004) Biodiversity and evolution of the Myxozoa.AdvParasitol56, 43-131. Chavda, D., Bhatt, S., Sreepada, R.A., Sheth, A. (2010) Pathogenecity of Myxobolus infection and its effect on protein expression in Catlacatla in Central Gujarat region. J Cell Tissue Res 10, 2157-2164. Current, W.L., Janovy, J. (1978) Comparative study of ultrastructure of interlamellar and intralamellar types of HennguyaexilisKudo from channel catfish. J Protozool25, 56-65. Davis, H. S. (1923) Studies on sporulation and development of the cysts in a new species of Myxosporidia, Lentosporaovalis. J Morphol37, 425-456. De Campos, C.M., Moraes, J.R.E., Moraes, F.R. (2011) Histopathology of gills of Piaractusmesopotamicus (Holmberg, 1887) and Prochiloduslineatus (Valenciennes, 1836) infested by monogenean and myxosporea, caught in Aquidauana river, State of MatoGrosso Do Sul, Brazil. Rev Bras Parasitol Vet 20, 67-70. Dey, R.K., Kumar, D., Mishra, B.K. (1988) Tissue level reactions in the Indian major carp Catllacatla due to Myxobolus spp. infection. Asian Fish Science 1, 11-122. Dykova, I., Lom, J. (1978) Histopathological changes in fish gills infected with myxosporidian parasites of the genus Henneguya. J Fish Biol12, 197-202. Dyková, I., Tyml, T., Fiala, I., Lom, J. (2007) New data on Soricimyxumfegati (Myxozoa) including analysis of its phylogenetic position inferred from the SSU rRNA gene sequence. Folia Parasitol54, 272-276. Eissa, I.A.M. (2002) Prasitic fish diseases in Egypt, 1st Edition. Dar ElNahdda El-Arabia Publishing, Cairo, Egypt pp: 52-53. Friedrich, C., Ingolic, E., Freitag, B., Kastberger, G., Hohmann, V. (2000) A myxozoan like parasite causing xenomas in the brain of the mole. Talpaeuropaea L., 1758 (Vertebrata, Mammalia) Parasitology 121, 438-492. Kalavati, C., Narasimhamurti, C.C. (1985) Histopathological changes in the gills of Channapunctatus BL. infected with Henneguyawaltairensis. Arch Protistenkd129, 199-202. Kaur, H., Attri, R. (2015) Morphological and molecular characterization of Henneguyabicaudi sp. (Myxosporea: Myxobolidae) infecting gills of Cirrhinusmrigala (Ham.) in Harike Wetland, Punjab (India). Parasitol Res 114, 4161-4167. Kaur, H., Dar., S.A., Singh, R. (2013) One new and three already known myxosporean parasites of Indian major carps in Punjab (India).Species 4, 17-24. Kaur, H., Katoch, A., Gupta, M. (2014) Thelohanellusfilli sp. n., a pathogenic myxosporean infecting gills of cultured carp, Labeorohita (Hamilton 1822) in Punjab, India. Species 10, 31-38. Kaur, H., Singh, R. (2008) Observation on one new species of the genus Myxobolus(Myxozoa: Myxosporea: Bivalvulida) and redescription of Myxobolusmagauddi (Bajpai, 1981) Landsberg and Lom, 1991 recorded from freshwater fishes of Kanjali Wetland of Punjab (India) ProcNatlCongrParasitol, NEHU Shillongpp: 75-79. Kent, M.L., Andree, K.B., Bartholomew, J.L., Matbouli, M., Desser, S.S. et al. (2001) Recent advances in our knowledge of the Myxozoa.J EukaryotMicrobiol48, 395-413. Lebelo, S.L., Saunders, D.K., Crawford, T.G. (2001) Observations of blood viscosity in striped bass, Moronesaxatilis (Walbaum), associated with fish hatchery conditions. Kansas AcadSci104, 183-194. Lom, J., Dyková, I. (2006) Myxozoan genera: definition and notes on taxonomy, life-cycle terminology and pathogenic species. Folia Parasitol53, 1-36. Lom, J., Arthur, J.R. (1989) A guideline for the preparation of species descriptions in Myxosporea. J Fish Dis12, 151-156. Longshaw, M., Frear, P.A., Feist, S.W. (2005) Descriptions, development and pathogenecity of myxozoan (Myxozoa: Myxobolidae) parasites of juvenile cyprinids (Pisces: Cyprinidae). J Fish Dis28, 489-508. Lowenstine, L.J., Rideout, B.A., Gardner, M., Busch, M., Mace, M. et al. (2002) Myxozoanosis in Waterfowl: A new host record?Proc Am Soc Zoo Vetpp:86-87. Luna, L. G. (1968) Manual of histological staining method of the Armed Forces Institute of Pathology.p: 111. Madhavan, R., Bandyopadhyay, P.K., Santosh, B. (2013) Observations on two new species of MyxobolusBütschli, 1882 from minor carps of Tripura, India. J Parasit Dis37, 56-61. Martins, M.L., Souza, V.N., Moraes, F.R., Moraes, J.R.F., Costa, A.J. et al. (1997) Pathology and behavioral effects associated with Henneguya sp. (Myxozoa: Myxobolidae) infections of captive pacuPiarcactusmesopotamicus in Brazil. J World AquatSoc, 28,297-300. Molnár, K. (2002) Site preference of fish myxosporeans in the gill.Dis Aquat Org 48,197-207. Moncade, L.I., Lopez, M.C., Murcia, M.I., Nicholis, S.L.F., Guio, O.L. et al. (2001) Myxobolus sp., another opportunistic parasite in immunosuppressed patients. J ClinMicrobiol39,1938-1940. Piper, R.G., McElwain, I. B., Orme, L. E., McCaren, J. P., Fowler, L. G. et al. (1982) Fish hatchery management.US Fish and Wildlife service, Washington, D. C.
Rukyani, A. (1990) Histopathological changes in gills of common carp (Cyprinuscarpio L.) infected with the myxosporean parasite Myxobolus koiKudo, 1920. Asian Fish Scipp: 337-341. Sabri, D.M., Eissa, I.A.M., Danasoury, M.A.,Khouraiba, H.M. (2010) Prevalence of Henneguyabranchialia in catfish (Clariasgaraiepinus) in Ismailia, Egypt. Int J AgricBiol12, 897-900. Saha, H., Saha, R.K., Kamilya, D., Kumar, P. (2012) Low pH dissolved oxygen and high temperature induces Jhelohanellusrohita (myxozoan) infestation in tropical fish, Labeorohita (Hamitton) J Parasit Dis,1-7. Sanaullah, M., Ahmed, A. T. A. (1980) Gill myxoboliasis of major carps in Bangladesh. J Fish Dis3, 349-354. Schulman, SS. (1957) Thepathogenecity of the myxosporidianMyxobolus exiguous in correlation to its epizootics parasites and diseases of fish. Bull InstFreshw Fish 42, 326-328. Shariff, N. (1982) Henneguyashaharini sp. nov.(Protozoa: Myxozoa), a parasite of marble goby, Oxieleotrixmarmoratus (Bleeker).J Fish Dis5, 37-45. Svobodova, Z., Lloyd, R., Machova, J., Vykusova, B. (1993) Water quality and fish health.Eifac Tech Pap, FAO, Rome p: 59. Szekely, C., Cech, G., Chaudhary, A., Borzak, R., Hridaya, S.S. et al. (2015) Myxozoan infections of the three Indian major carps in fish ponds around Meerut, UP, India, with descriptions of three new species, Myxobolusbasuhaldari sp., M. kalavatiae sp. and M. meerutensis sp. and the redescription of M. catlae and M. bhadrensis. Parasitol Res 114, 1301-1311.